This inspiring story is about Krochet Kids, a hats and accessories company, that has partnered up with Nordstrom to help support women in Uganda. Not only are they giving women in need a wonderful opportunity to help their families, but also Nordstrom customers a way to give back! 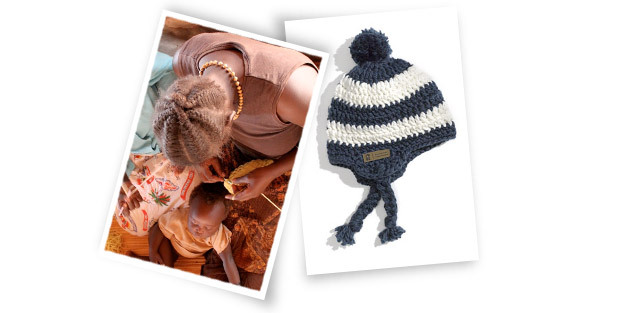 In 2007, Kohl, Travis and Stewart founded Krochet Kids International (KKi), a non-profit organization working with a growing number of women in war-torn, northern Uganda to create a collection of men’s and women’s crochets hats and fashion accessories. More than 85 women in Uganda are employed to create the hats, earning fair wages, training and education so they can provide for their families and begin planning for a better future. KKi believes in quality, handmade products that bring comfort and style while serving as a vehicle for social change. Introduced to a select number of Nordstrom stores in October 2010, the Krochet Kids hats were popular with customers and the product soon sold out. “When customers hear the story behind the product, they fall in love with it,” said Janae. Each hand-crocheted hat features a label that is personally signed by the woman who made it. Customers can learn the woman’s story and thank her through the Krochet Kids website. That personal contact is soon going to be even more accessible. “This year’s new line of hats will have smart phone tags sewn in the labels which will take you directly to the website so you can write a thank you note to the woman who made the hat,” said Janae. The purchase of crocheted hats and accessories helps KKi sustain and grow current job and income programs as well as empower future generations through education. “The cooperation of our staff in America and artists in Northern Uganda has created a sustainable cycle of employment and empowerment,” said Kohl Crecelius, CEO and co-founder. Knitting Today has some adorable Halloween themed patterns, but these two in particular caught my eye! These candy corn and haunted house pillows aren’t designed to be spooky, but they are a great hand-made and timeless decoration! Crocheting a place for your treats! Still trying to think of creative costume ideas? Well while you still have some time for that, it might be a good idea to try crocheting a cute bag to carry all of your treats in on the big night! This adorable bag designed by Cylinda Mathews would be great for anything you wanted to bring with you, including candy, party favors or even just make it a part of your costume! Beg V St: (Ch 5, dc) in indicated st.
V St: (dc, ch 2, dc) in indicated st.
Dc Dec: (yo, insert hook in next st, pull up a lp, yo, draw through 2 lps on hook) 3 times, yo, draw through last 4 lps on hook to complete the st.
Rnd 1) Ch 31; (2 sc) in 2nd ch from hook, sc in next 28 ch, (2 sc) in last ch, working up opposite side of foundation ch in free lps, sc in next 28 sc; join with a sl st in first sc: 60 sc. Rnd 2) Ch 1, sc in joining; * sc in next sc; rep from * around; join with a sl st in first sc: 60 sc. Rnd 3) Ch 3 (counts as first dc); * dc in next sc; rep from * around; join with a sl st to first dc: 60 dc. Rnd 4) Ch 3; * dc in next dc; rep from * around; join with a sl st to first dc: 60 dc. Rnd 5) Beg V st in joining see special sts), sk next 2 dc; * V st in next dc see special sts, sk next 2 dc; rep from * around; join with a sl st to 3rd ch of beg ch 5: 20 V sts. Rnds 6-16) Sl st in next sp; Beg V st in same sp; * V st in next V st sp; rep from * around; join with a sl st to 3rd ch of beg ch 5: 20 V sts. Rnd 17) Ch 3, dc in next sp, dc in next dc of V st; * dc in next dc of V st, dc in next sp, dc in next dc of V st; rep from * around; join with a sl st to first dc: 60 dc. Rnd 18) Ch 3; dc in next 9 dc, ch 14, sk next 14 dc (creating handle), dc in next 16 dc, ch 14, sk next 14 dc (creating opposite handle), dc in last 6 dc; join with a sl st to first dc: 32 dc. Rnd 19) Ch 3, dc in next 9 dc, dc in next 14 ch, dc in next 16 dc, dc in next 14 ch, dc in last 6 dc; join with a sl st to first dc: 60 dc. Fasten off, secure ends. Join orange yarn to first unworked dc on bottom edge of handle with a sl st; working across the bottom edge of handle, sl st in next 13 dc, sl st over dc post on rnd 18, sl st in next 14 dc working on opposite side of ch in free lps directly across from each dc worked on rnd 19, sl st over dc post on opposite side of handle; join with a slist in first st. Fasten off, secure ends. Rnd 1) Starting with head: ch 4; (13 dc) in 4th ch from hook (first 3 chs skipped count as first dc; join with a sl st to first dc: 14 dc. Row 1) Shoulders: ch 1; (5 sc) in joining: 5 sc. Row 2) Ch 2, turn work; (3 sc) in first st, sc in next 3 sc, (3 sc) in last sc: 9 sc. Row 3) Ch 2, turn work; (2 sc) in first st, sc in next 7 sc, (2 sc) in last sc: 11 sc. Row 4) Body: ch 1, turn work, sl st in first 4 sc; ch 3, (2 dc) in same st, dc in next dc, dc dec over next 3 dc see special sts, leaving last 3 sc unworked: 5 sts. Row 5) Ch 2, turn work; dc dec over next 2 sts (beg 3 dc dec made), dc in next dc, (3 dc) in last st: 5 sts. Row 6) Ch 3, turn work; (2 dc) in first st, dc in next dc, dc dec over next 3 sts: 5 sts. Row 7) Ch 3, turn work; (2 dc) in first st, dc in next st, dc decr over last 3 sts: 5 sts. Row 8 ) Ch 2, turn work; dc dec over next 2 sts, dc in next dc, (2 dc) in last st: 4 sts. Row 9) Ch 2, turn work; dc dec over next 2 sts, (2 dc) in last st: 3 sts. Row 10) Ch 2, turn work; dc dec over last 2 sts: 1 st. Fasten off, secure ends. 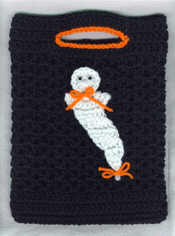 Attach ghost to front of bag by clipping two lengths of orange yarn. Tie one length around the ghost, just below the head, through the bag. Tie into a bow at center front under head. Tie the 2nd length around the tail of ghost,working the length through the bag. Tie into a bow at center front. Glue eyes to face of ghost. So many things to Knit in October! With Halloween to look forward to at the end of this month, we thought it would be fun to give everyone from beginners to experienced knitters and crocheters some fun ideas to work on! 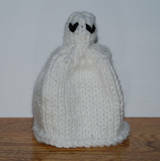 Our first project is a knit ghost, perfect for a fun Halloween decoration! This knit ghost is really easy to work up on three double-pointed needles. Use a few as decoration on your dining room or entry way table, hang a couple from the light fixtures, hang it on a string around your kid’s bedroom door, or use it as a zipper pull on your purse or backpack. To make this a hanging project instead of a sitting project like you see, leave an extra-long tail when you cast on. After you close up the top of the head and the neck, bring the yarn back out through the top of the head and use it to hang the ghost. two cotton balls or a small amount of fiberfil. 5.5 stitches and 6 rows per inch knit in the round. Gauge is not critical. Finished size is four inches tall. Distribute evenly on two double-pointed needles. Join in the round, being careful not to twist the stitches. Place a marker to mark the end of the round if desired. On the next row, knit one, *yarn over, knit two together. Repeat from * to the last stitch, knit one. Knit in the front and back of each stitch; 20 stitches total. Knit in the front and back of each stitch; 40 stitches. Knit every round until piece measure 4 inches. To finish the ghost’s face, knit on two eyes using the duplicate stitch technique. Thread the cast-on yarn tail onto a yarn needle. Weave the needle through the cast on edge. Pull tight until the top closes up. Stick a couple of cotton balls or a bit of fiberfill into the head of the ghost. Use the cast-on tail to weave in and out of the yarn over holes at the base of the head. Pull tight. Weave in the end or pull back through the top of the head to hang. Weave in the bind-off yarn end and enjoy!